Back in May Image-Line unleashed the latest version of the DAW formerly known as Fruity Loops. Version 11 of FL Studio brought with it a host of new features, including new plugins like Bassdrum and Groove Machine Synth, the new Performance Mode, multitouch support and loads more. Check out our review of the software to find out our thoughts on the update. 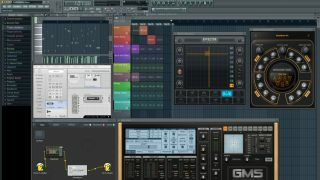 Below we bring you a fitting eleven quick tips and tricks to help you work smarter and more creatively in FL Studio 11. For more on working with FL studio's new plugins and features, check out the October issue of Computer Music (CM 195) which is on sale now. You can now enter precise parameter values into many FL Studio plugins by simply right-clicking on the knob, slider or other control you're editing and selecting Type in value. Extremely handy in situations where the smallest change can make a big difference. The FL 11 mousewheel action doesn't end there! Rolling it while clicking and holding a note adjusts that note's velocity, while holding Ctrl, hovering over a channel and rolling the wheel cycles through the assigned mixer tracks. It can often be a good idea to make variations on the hook of a track, and a handy addition in FL Studio 11 that can help with this is the ability to play truncated notes. What this means is that if you use the cut tool to cut out a section of a clip in the Playlist (to insert a new short section, for example), notes that have had their starts cut off but still otherwise remain will play from their new start points. To enable this, head to Options and, under Project general settings, enable Play truncated notes in clips. If you have two sequential MIDI notes on the same Piano Roll note lane that you want to merge into one, rather than deleting the second and extending the first, you can now just click and hold the end of the first note, invoking the Resize cursor, and the second (provided it neighbours the first) will merge into it, creating one continuous note. Amongst its many other talents, Newtone can convert audio to MIDI. Whether you want to capture a sampled riff as MIDI, or hum or whistle a melody as a starting point for a project, all you have to do is drag your imported or recorded audio into Newtone and click the Send to Piano Roll button at the top of the interface. When moving notes in the Piano Roll or clips in the Playlist, it's all too easy to drag them up or down accidentally when you only mean to move them left or right, and vice versa. FL Studio 11 introduces a handy feature to get around this: hold Ctrl while dragging to restrict movement to the vertical plane, or Shift to enable horizontal movement only. Using FL Studio's Plugin Picker couldn't be easier, and doing so will speed up your whole creative process. Click the mousewheel in a blank area of the interface to open it and view your plugins collection. You can then drag the plugin of your choice to its destination, replacing an existing one if necessary, or just double-click to open a new instance of it. What's more, as of version 11, you can begin typing a plugin's name in the Plugin Picker to highlight it. Improve your workflow in the Piano Roll by changing tools via the mousewheel. Right-click and scroll the wheel in a blank area of the Piano Roll to cycle between tools without having to move to the top bar. Particularly useful for quickly switching from the brush to the cut tool and back, for example. Missing the old behaviour of the brush tool since it changed to placing notes monophonically? Hold Shift while using it to return to its old behaviour, which is more akin to the draw tool. However, a handy feature of the brush's new behaviour is that you can mute notes with it by right-clicking above or below them in the Piano Roll. The notes will mute and turn grey until you right-click again. Ideal for trying out chord variations. As well as the Plugin Picker, FL studio features the less well-known Project Picker, which can be a lifesaver when arranging complex projects. Right-click the name of the current clip source at the top of the Playlist view to open it. The Project Picker gives a clear layout of all the patterns in your project from which to choose. Hovering the mouse pointer over them will preview them. If your chords are not simple blocks of notes all starting and ending at once, but rather overlapping notes of varying durations, you can convert them to the former with the new Chop Chord tool (added to both the Strum and Articulate tools in the Piano Roll menu). It creates 'full' chords by chopping any sustained notes wherever a new note starts.